I have read Agatha Christie in the past for school. This was the first I had read on my own, as an adult. The tale was gripping and kept me finding excuses to keep listening. And, at the end, I actually got chills when all was revealed. I have never experienced that with a story before. I will definitely be listening to more Agatha Christie! 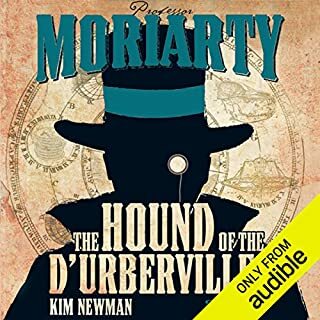 The idea behind the novel is actually kind of neat; you see a lot of similar-yet-different stories from Moriarty's and Moran's points of view. The execution is rather poor. I understand that the novel is set in the 1800s and certain opinions and prejudices were considered acceptable during that time... but the book was published within the past few years. CERTAINLY the author could have come up with a more creative way of telling these stories than relying upon racial, ethnic, and sexual slurs. The prologue discusses the fact that there is an abundance of profanity, but then to keep the profanity in the novel with letters blanked out, especially for words that are ridiculously unnecessary (C--T? really? ), is absurd. I am a HUGE Sherlock Holmes fan and I was utterly disappointed by this novel. Not worth your credit unless you enjoy repeatedly hearing about how only white British men are intelligent and know how to keep proper hygiene. 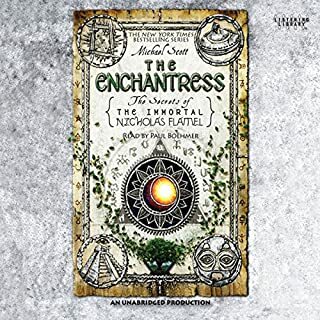 Adapted from the hardcover edition of The Enchantress, this long-anticipated audiobook brings the Secrets of the Immortal Nicholas Flamel series to its stunning conclusion. The twins of prophecy have been split. Nicholas Flamel is near death. John Dee has the swords of power. And Danu Talis has yet to fall. The future of the human race lies in the balance - how will the legend end? Beautiful end to an incredible story. Overall OK but some issues along the way. While I have stuck with this series long after its novelty had worn off, I do think it was an overall "good" series. I do have some issues with it, though. You can tell the author tries hard to not favor one gender over the other throughout the series -- there are both male and female warriors, male and female good guys and bad guys, a boy and girl twin of legend, etc... However, there were a lot of blatant sexist moments that just bothered me as I was listening. Even though Sophie has a lot going for her, the characters rarely complement her on how strong she is, as they do so frequently with Josh. And even female elders and creatures are not above calling one another ugly as insults, and it takes the male characters to calm them down and stop them from fighting. Yep. Good ol' girls just can't keep from being at each other's throats out of jealously over the way they look without the men keeping the peace and preventing them from getting hysterical. I literally rolled my eyes throughout the entire scene because, SERIOUSLY, you're going to fight over who is ugly when there's so much else going on around you? Seriously? I can't believe this scene actually made it into the book, it added absolutely nothing to the story, and simply added time to this already ridiculously long story. But... as I said. Overall, it's an interesting story, but I will not listen to it again. Tally Youngblood never felt like the other Pretties - she almost didn't become one. But Tally isn't the only one who feels like she's missing a part of herself. 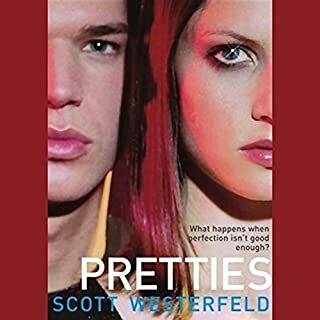 After uncovering sinister clues about the Pretty surgery, she stumbles upon a possible cure for Pretty-mindedness and a possible escape from the city. But the cure could have deadly consequences. I am going to have to disagree with most of the other reviewers -- I actually enjoyed the second book more than the first. I almost did not continue with the series (especially seeing as how the titles and blurbs are giant spoilers and thought I knew what to expect), but I am glad I did. 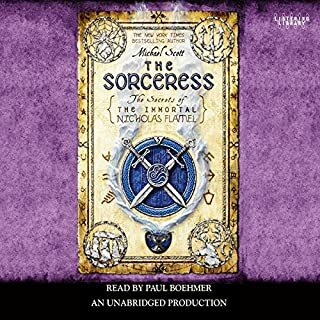 Yes, ok, the narrator is a little... undesirable... but the story itself ended up being a lot different than what I expected. Trying not to spoil anything, I expected Tally to be and do the exact opposite once she became Pretty; it was a nice surprise to find her being a strong character considering how much she was pushed around in the first book. Nicholas Flamel's heart almost broke as he watched his beloved Paris crumble before him. The city was destroyed by Dee and Machiavelli, but Flamel played his own role in the destruction. Sophie and Josh Newman show every sign of being the twins of prophecy, and Flamel had to protect them and the pages from the Dark Elders. But Nicholas grows weaker with each passing day. Perenelle is still trapped in Alcatraz, and now that Scatty has gone missing, the group is without protection. I'm not quite done with this one, and while the narrator is NOT as good as the first two, he isn't as bad as I thought he was going to be based on the other reviews. He is a little stilted at times, but I did not find his accents to be horrible. As far as the story goes itself, as I said, I'm not finished yet, but there is definitely a lot less action than in the first two books; a lot more (sort of) background and talking and waiting. I'm not giving up on the series yet, especially after the first two, but hopefully it will pick up. 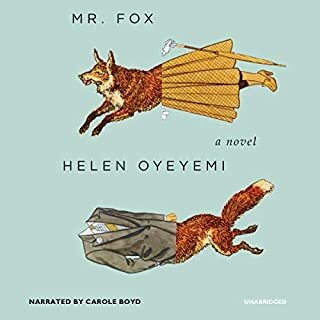 Would you consider the audio edition of Mr. Fox to be better than the print version? 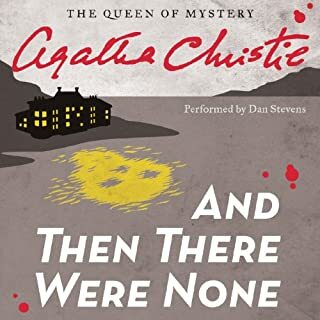 Probably not since there are no audible chapter breaks, so the story shifts very quickly without warning, and sometimes it is difficult to follow along. Additionally, some of the accents were very difficult to understand. Mary, because her story is probably the most complex. I would love to figure out which stories were true, or had a truth to them. Probably the boys' boarding school story. The ending was kind of haunting and gave me chills, and the whole idea of boys being trained to be perfect husbands is a great satire on Victorian-era views of women. If you could take any character from Mr. Fox out to dinner, who would it be and why? Mr. Fox, definitely. He's very witty. I'd also love to figure out which stories were his and which were Mary's. Also, to try to pick his brain about what happened to Mary. I also really love the letters between Sinjin and Mary early in the book. I was actually very surprised by the ending.... But I won't say too much lest I give something away.